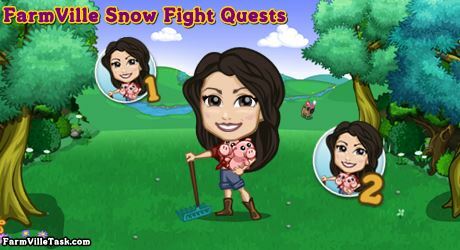 It’s that time of the year once again for the annual game that we play in FarmVille Snow Fight Quests. We will help our friend Sasha in organizing this event as we compete with other participants. Sasha is so excited for this event that she has just lined up a list of activities. On this FarmVille Quests, we are going to craft 9 recipes at the SPA, BAKERY and WINERY. We can collect the bushels early and save it for once the quest calls for it we will be ready. Note: Expected to be released on Thursday (Dec 6th). Info: 8 hours to grow and harvest. Quest Handicap: 60 – 54 = 6 amount to harvest. Info: Crafted at the WINERY and will need Rice Bushels x15 and Cranberry Bushels x9. Quest Handicap: 90 – 81 = 9 amount to harvest. Info: Crafted at the SPA and will need Yellow Marigold Bushels x9, Flax Bushels x9 and Raspberry Bushels x3. Quest Handicap: 120 – 108 = 12 amount to harvest. Info: Crafted at the BAKERY and will need Grape Bushels x3, Blueberry Bushels x9 and Raspberry Bushels x9. Quest Handicap: 150 – 135 = 15 amount to harvest. Info: Crafted at the WINERY and will need Raspberry Bushels x6, Blueberry Bushels x6 and Sugar Cane Bushels x4. Quest Handicap: 180 – 162 = 18 amount to harvest. Info: Crafted at the SPA and will need Blueberry Bushels x6, Lilac Bushels x6 and Basil Bushels x4. Info: Crafted at the BAKERY and will need Blueberry Bushels x6, Blackberry Bushels x4 and Raspberry Bushels x6. Quest Handicap: 200 – 180 = 20 amount to harvest. Info: Crafted at the WINERY and will need Blackberry Bushels x6, Grape Bushels x2 and White Grape Bushels x6. Quest Handicap: 220 – 198 = 22 amount to harvest. Info: Crafted at the SPA and will need Red Tulip Bushels x1, Aloe Vera Bushels x3 and Blackberry Bushels x3. Quest Handicap: 240 – 216 = 24 amount to harvest. Info: Crafted at the BAKERY and will need Zucchini Bushels x6, Red Wheat Bushels x2 and White Grape Bushels x6.